In a previous blog post I mentioned the early Europa omnibus issues and how much I like them. 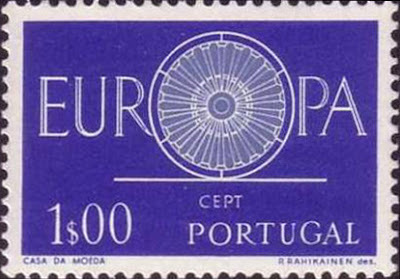 Up to 1974, they usually had a common design but each country was allowed to fiddle a bit with that design. 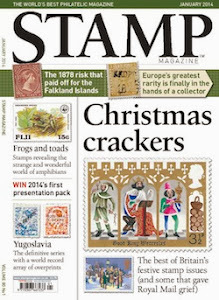 The result was a coherent set of issues which still breathed enough individuality to keep things interesting. 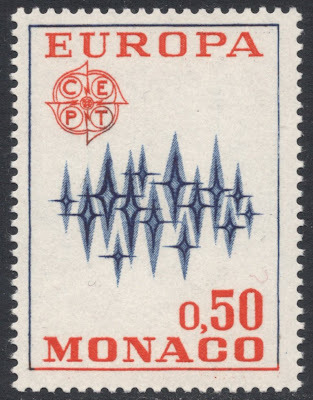 In that blog I showed the Liechtenstein stamp of 1972 and mentioned that it was rather different from the ordinary ones, which are portrait-size and usually have the design smaller on a larger blank field, such as on this Monaco version. The design, by Finnish artist Paavo Huovinen, is a stylised version of the aurora borealis, or the northern lights. 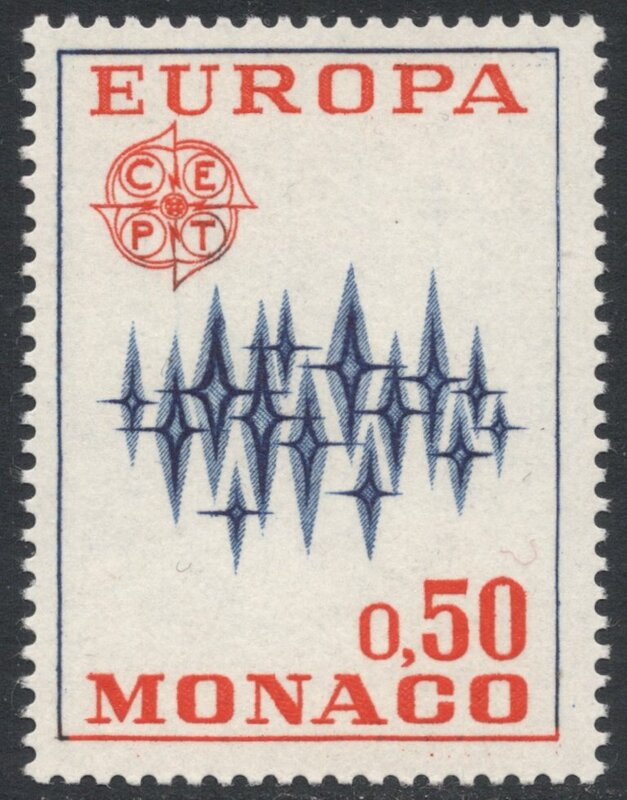 The design is also meant to symbolise the theme of 'Communication'. 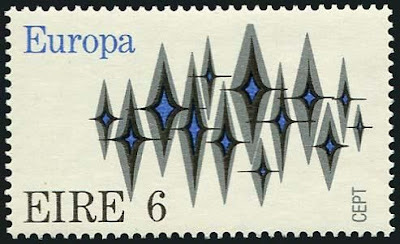 Liechtenstein was not the only one to turn the design into a landscape-size stamp. Ireland, too, went down that road. 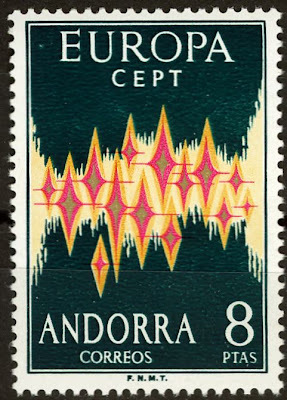 The key item from that particular year was the Spanish Andorra version. 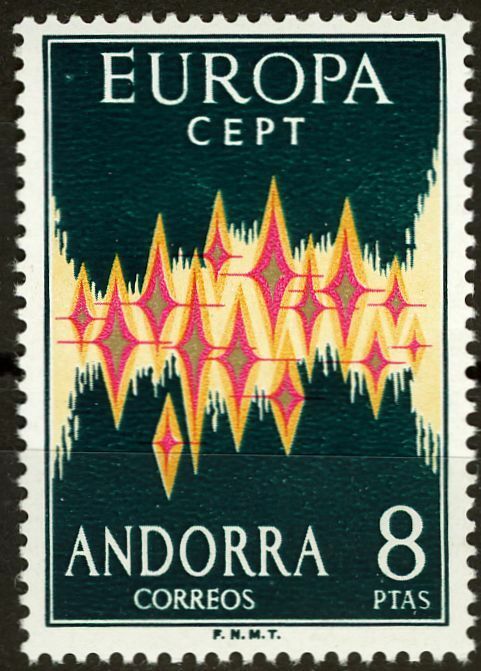 Spanish Andorra joined the group of countries issuing Europa stamps in that year and the limited numbers printed were happily snapped up by Spanish philatelic speculators, making it even now by far the most expensive set from that year. 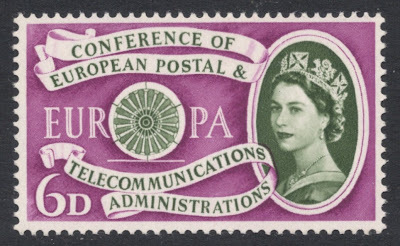 The United Kingdom was a bit of a reluctant participant in those early years, and the fact that they had to really mess about with the common design in order to include the monarch's portrait may well have contributed to that fact. However, they did go to that length every now and then and shown here is their version of the 1960 design by yet again a Finn, Pentti Rahikainen. As you can see it is rather an embellished (nicely done though!) version of the common design, shown here on a Portuguese stamp. 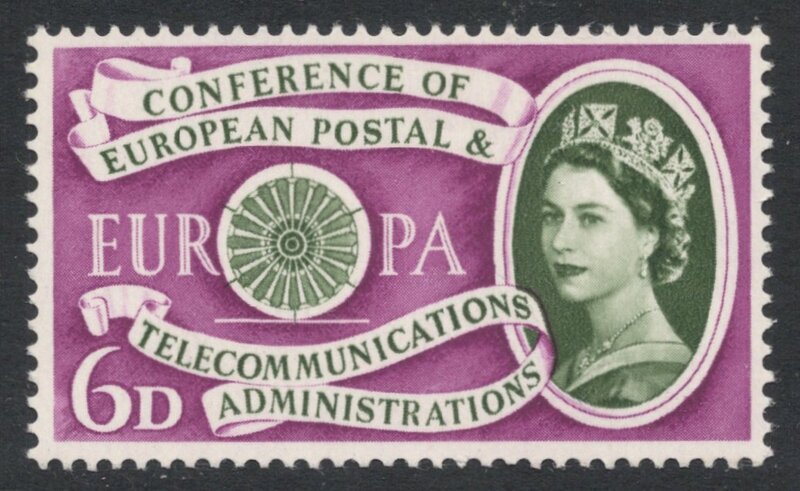 This was actually the very first CEPT (European Conference of Postal and Telecommunications Administrations) issue, all previous ones being 'merely' Europa issues. 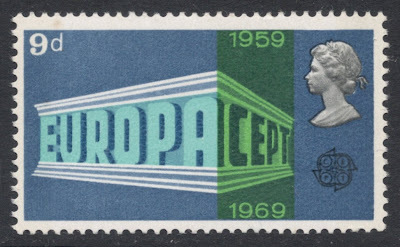 The CEPT was founded in 1959 and its tenth anniversary was marked with a set which again saw the UK participating. 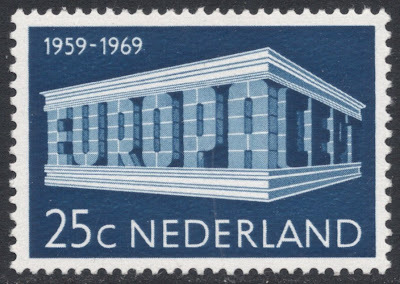 The common design, by the Italians Luigi Gasbarra and Giorgio Belli, depicts a classical temple made up of the words Europa and CEPT. 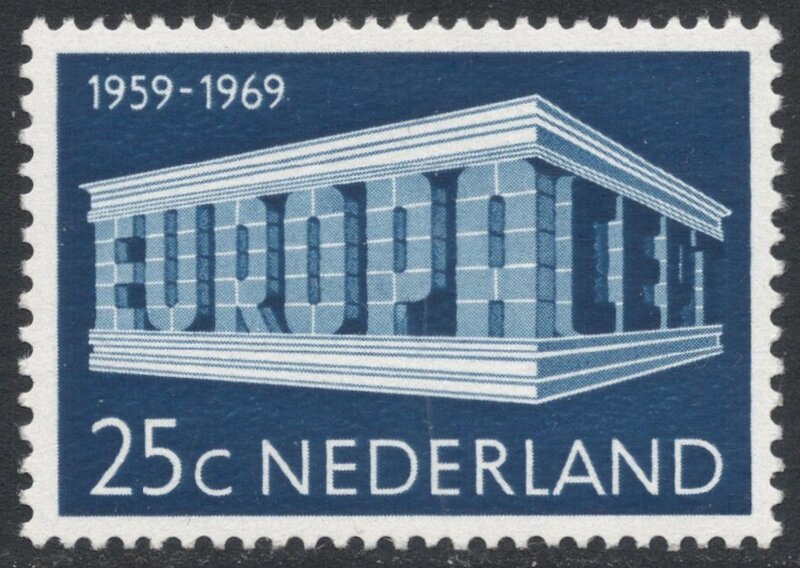 By this time, the UK had moved on to just a cameo head rather than a large portrait of the Queen, so adapting the common design was not as hard as it used to be. The green band is a nice touch, I think! So, as you can see, there's a lot of fun to be had with these early Europa omnibus sets, and I still think it is a great pity they didn't continue with them. But as with so many other good things, they never last forever.